7.47 points at 17 votes (rank 217). 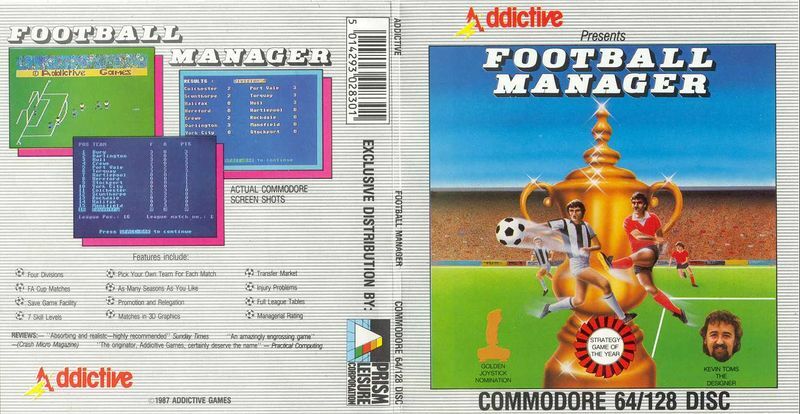 The mother of all football manager games, which was first developed in 1982 for the ZX Spectrum by Kevin Toms and ported to different home computer systems until 1984, also to the C64. 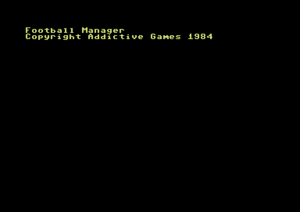 The genre was very popular, so that there was a direct follower and many other football manager programmers from other game manufacturers. You can choose between 7 difficulty levels (from simple = level 1, to almost not feasable = level 7) and start in an invented English 4th league with 16 teams and play a simple series (including Cup). This way you work your (or the team's) way up, so into the next higher league (up to the 1st). Managing is limited to the purchase and sale of players and their lineup. The manager part is based on mere text input and output and without any convenience. The game scenes are realized quite archaical with sprites, the simplest form of "moving graphics". But this was the beginning and for mere "trainer"-managers well suited, as there was nothing else you had to look after than the lineup of the players for the next match. Except for the really exciting goal scenes (you never know exactly what the programme has calculated), there is only text in the rest of the game. Graphical elements that would lighten the whole thing, are fully missing in the manager part. The game consists mainly of three main parts. If a saved score is loaded the game starts with part 2. Then you can choose the team: enter the number of the team (99 for the next page), confirm with Return. Now you can choose the difficulty grade by entering a number from 1-7 (1 = very easy, 7 = very difficult), confirm with Return. Here you can do different activities. You leave this menu by pressing the Space bar. Sell/list your players, key "a"
"Space" to go back to the main menu. "Y" - accept. The player is sold and the money is added to your account. Then you are back in the main menu. Of course you can refuse more often, it can happen that another club offers more money, but it can also happen that no other club wants your player and you are stuck with him. Print score etc., key "s"
current position of your team in the league, number of matches played in the current league. Obtain a loan, key "o"
Enter the amount that you want to borrow (league 4: 250.000 pounds, league 3: 500.000 pounds, league 2: 750.000 pounds, league 1: 1.000.000 pounds). Confirm with Return, with Space go back to the menu. Pay off loan, key "p"
Enter the amount that you want to pay back. Confirm with Return, with Space go back to the menu. Display league table, key "d"
You see the current ranking in the league, the score of the single teams, your position in the league and the number of matches that were played in this season. With Space you get back to the menu. Change your skill level, key "l"
You can also change the difficulty grade during a season. Enter 1-7, confirm with Return, go back to the menu with Space. Change team or player names, key "c"
Now you are asked whether you want to change your team's name. "Y" - Your teams will be shown. Now choose the team by typing the team number. Confirm with Return, enter the new name, press Return. Then you are asked if you want to change further team names. "N" - Back to main menu. "Y" - The player's names are shown. By entering the player number you choose it, press Return key, enter new name, press Return key. Then you are asked wheter you want to change further player names. "Y" - Change next name. Notice: The score can only be saved on datasette in the original game. (In the version by "Emulators" up to 10 scores can be saved to disk). Restore saved game, key "r"
Notice: The score can only be loaded from datasette in the original game. (In the version by "Emulators" a score can be loaded from disk). First you are shown which team will be your opponent in the next match. You leave this screen with the Space key. Energy. This value is the average of all players that take part in the match. Morale. It is 10 at the beginning of the season, falls when losing a match and rises when a match is won. Furthermore the number of players in your own and the opposing team is shown. By pressing the Space key you get to the display of the highlights of the match. With the key "T" you get to the part where you can change the lineup of your team. Here you get shown your players and their status (description see "phase 1 / Sell/list your players"). By typing the player's number you can take players into the team (no injured players) or remove them. (Up to including 11 players they are taken into the team, when having more than 11, removed). Players that pause rest and get more energy. By pressing the space key you get back to the screen that shows the total strengths of the teams. The moment of truth! You see the shots on the goal by your own and the opposing team in "3D graphics" and you can only hope that you have made no mistakes. It has happend, hasn't it? Now the final score and the revenue of the match is shown. Be aware that the revenue for home matches rises if you win more often and falls if you lose. In the away game the revenue depends on the quality of the opponent. Now you get the possibility to buy a player. The more you overbid the requested value, the higher is the chance that he takes the offer. If your offer is not taken, the next requested amount will be higher. If the message "No player for sale" appears, you need to sell a player from your team to make place for a new one. These 5 phases are repeated one after the other until 15 league matches and all cup matches are done. As long as you are still in the Cup, every second match will be a Cup match, which of course does not concern your position in the league. If a Cup match ends in a draw if is instantly repeated. First the final league table is shown. Depending on the reached rank, your club will get a bonus payment. The first three clubs are promoted into the next higher league, the last three are relegated. The management's quality is recalculated. Strength and energy of the players are recalculated. The new season starts with "Part 2". In contrast to reality, you can also use less than 11 players in the Football Manager. When players are injured and you have a small squad, this can be necessary. H.T.W: "A real original old game from the section of football manager games and each time it is again very interesting. You just want to play it shortly and when you realize it you are already playing it for 3 hours. By the simple operation of the rather few possibilites to encroach on the happenings, a fast game unfolds and the display of the highpoints of the game is also done successfully and partly also funny to look at (it can sometimes happen that the goalie flees from the ball or the striker and opposing defender practice passing each other the ball excessively). As a minus point you could say that there is no possiblity for a multiplayer game and saving the score is on the original game only possible by datasette (in the version by "Emulators" you can also save on disk). Nevertheless: Always worth a match!". This page was last modified on 6 March 2016, at 07:32.